Located in Vienna’s third district is a Viennese museum that many visitors will find fascinating. 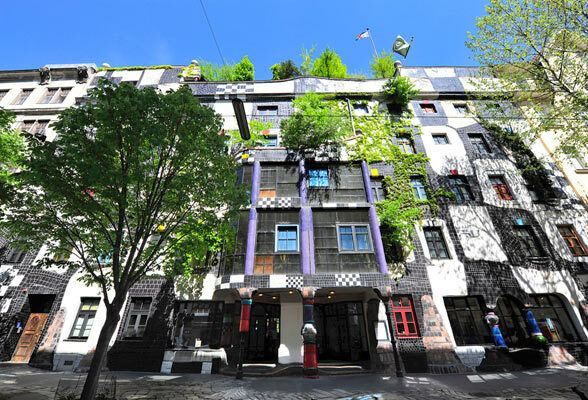 Established in 1991, the Kunst Haus Wien was designed by Friedensreich Hundertwasser, a unique Austrian painter and architect. The Kunst Haus contains the Museum Hundertwasser – the world’s only permanent collection of Hundertwasser’s work – and a second exhibition area that hosts a regularly changing line-up of international exhibitions. The Kunst Haus Wien was created through the remodelling of an 1892 building which was home to the Thonet furniture factory. Anyone familiar with Hundertwasser’s projects will know that straight lines are a rarity in his designs. To Hundertwasser, straight lines are “the devil’s tools”. The Kunst Haus Wien is the embodiment of Hundertwasser’s style. Here visitors will see undulating floors throughout, bright colours and forests of indoor plants. The Kunst Haus Wien has a Museumshop that sells t-shirts, posters, porcelain and other gifts and souvenirs. At the Cafe-Restaurant Dunkelbunt visitors can relax in this green downtown oasis and enjoy a drink or meal. The Museum itself has a cross-section of Hundertwasser’s works, including paintings, graphic works, applied art and architectural designs. At the Hundertwasser Museum, visitors can learn more about the individual, his philosophy and approach towards his art and architecture. Kunst Haus Wien is open daily from 10:00 to 19:00, including Saturdays, Sundays and public holidays. Audio guides are available and you can also join in one of their guided tours. A short distance away is another of the artist’s projects, the Hundertwasserhaus. Although this Vienna City Council housing project can only be viewed from the outside, it is worth going to Kegelgasse 34-38, 1030 Vienna to see a live example of Hundertwasser’s work. See the sights of Vienna at Travelsignposts gallery HERE.